Artist Wayne Wolton at work in Hull Central Library exhibition space this week. Have you ever noticed just how many domes there are in Hull’s skyline? You may instantly picture the magnificent domes of the Maritime Building or the City Hall, but Hull is blessed with many more of the classic hemispherical structures. Local artist Wayne Wolton has embarked on a week-long live drawing exercise to put the domes and their buildings at the heart of our conversations about the city. By capturing these crowning architectural features, which evolved from the arch – the circular form symbolising eternity, perfection and the heavens – in all their glory and variety, Wayne is encouraging residents and visitors to the city to look up, and look again at the Domes of Hull. 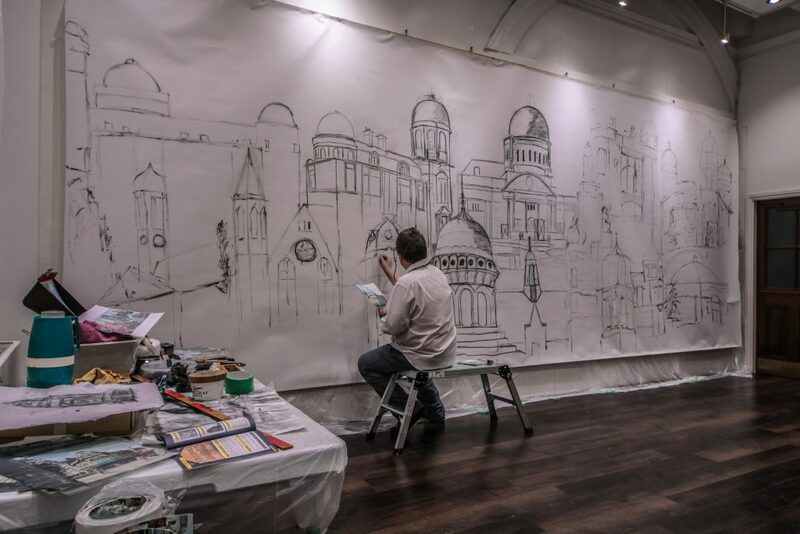 Inside the exhibition space, on the ground floor of Hull Central Library, visitors to Domes of Hull will find Wayne working away, on his ten metre long by three metres high drawing. For Wayne the domes evoke the memories of days out to the city, a city a world away from his childhood home of Withernsea. Ever since then he has been fascinated by the city – the place and its people. On the first day of the project Wayne, a Youth Arts Worker at Bransholme Community Arts Enterprise for over a decade, stared at the expanse of white paper fearful to begin the work. Thankfully a friend helping in the set-up suggested throwing some charcoal powder at the sheet in order to make the first mark. “It’s much more of a physical experience drawing in this way,” Wayne explains, dressed in a once white shirt and shammy leather tie. Wayne’s work is process and material-led, for Domes of Hull he is working with graphite powder, home-made charcoal sticks and graphite putty. The shammy leather tie is not just for decoration, but used as a tool for smudging and erasing marks on the expanse of paper. There is a row of grubby-looking shirts hung up on an adjoining wall, one for each day he has worked on Domes of Hull. Inside the space you can also find other works by him including, a wall of painted profile images of friends from social media, and a selection of Wayne’s white phone box photographs, all of which serve as easy conversation starters. “It’s as much about the people who are coming in and the talking that goes on, than it is about the actual drawing. It’s not at all about having a finished product and displaying that somewhere for people to look at, I want people to come in here, to be inspired by the domes and the conversation to then go out and look again at all the different parts of the city,” said Wayne. For some this might encourage asking questions, dipping into history and finding out about the origins of a building: who built it, when and why? For others the exploration is about myth-making, using their imagination to create their own stories. There is intrigue and mysteries to be found everywhere, for instance have you ever noticed how much the dome on the corner of King Edward Street looks like it belongs in Captain Nemo’s underwater city; or why the cowled figure on the Queen Victoria statue appears to be holding a dome? And just who is that lady sitting between the domes atop the old Tower Cinema, and why does she sit there? Through this process of drawing and talking to members of the public, Wayne is uncovering personal stories, civic histories, and celebrating the hundreds of domes across the city. Despite the artist not focusing on an end product, visitors can view Domes of Hull the finished work Saturday 23rd February from 12 noon until 3pm, to see how it has developed throughout the week. In the meantime people can meet Wayne to talk about his work, the domes and the city, during normal library opening hours. Domes of Hull and Wayne Wolton gratefully acknowledge the support of Hull City Arts Unit and Hull Central Library (Hull City Council). Be the first to comment on "Artwork challenges people to raise their eyes to city domes"